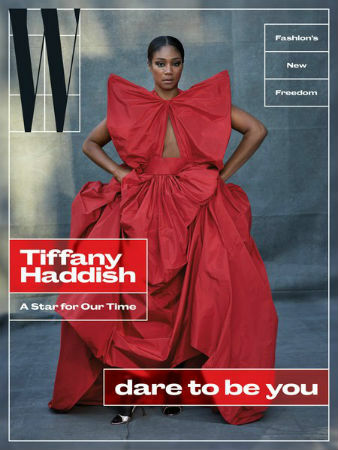 –Tiffany Haddish is crushing it in haute couture on the new W cover. The inside shots are equally wonderful. -This year’s TIME’s 100 Most Influential List has arrived and the profiles (which are written by other famous people) are often wonderful. Some notable ones: Lynda Carter wrote about Gal Gadot, Judd Apatow wrote about Kumail Nanjiani, Kevin Hart wrote about Tiffany Haddish, Mindy Kaling wrote about Issa Rae, Naomi Watts wrote about Nicole Kidman, Anne Hathaway wrote about Hugh Jackman, Lupita N’yongo wrote about Trevor Noah, Sarah Paulson wrote about Sterling K Brown, and Chris Pratt wrote about John Krasinski. -I’m sooo curious about the blind item at the end of this article, which says an hour-long TV drama that’s listed as a “safe bet” for renewal may not return after all because the male lead has become so impossible to work with. The site’s current safe bet dramas are Blacklist, Scorpion, Lethal Weapon, Lucifer, Prison Break, and Chicago Med. I don’t watch any of those…but I still wanna know! –Beyoncé will “switch up a couple things” for her Coachella weekend two set, one of her dancers says. Unfortunately, it won’t be live-streamed anywhere. –Cardi B visited Ellen for the first time and explained just how she got pregnant… by showing photos of her twerking at Coachella. –Kanye West is dropping two albums this summer — one solo and one with Kid Cudi. -This video of how actors get paid (residuals, scale, day rates) is kind of fascinating. -Angelina Jolie expertly flies a plane over desert in a new documentary, proving there really is nothing she can’t do. -Riverdale aired its musical episode last night, and all anyone can talk about is Archie’s dorky dancing. -Scandal wraps up tonight with the series finale, and there’s been a lot of articles about how it changed the game. I especially like this one on its legacy. -Speaking of celebs I adore, Letitia Wright rapped about Red Lobster and vibranium for Jimmy Fallon. –Gwyneth Paltrow and Stephen Colbert teamed up to sell GOOP-like products, including a set of five “Dream Twigs,” made from “self-actualized wood that volunteered to become pencils,” and a journal titled “My Incoherent Ramblings.” Proceeds go to public schools. -The Crazy Rich Asians trailer is finally (finally!!) dropping on Monday. This sneak peek has me excited. -The final Deadpool 2 trailer makes fun of other superheros and features an awesome moment for Rob Delaney as Peter. But damn, why so much TJ Miller still?